The Philadelphia Eagles meet the New England Patriots in the Super Bowl on Sunday (February 4). But, 52 years after it began, this may be the last time the Super Bowl commands American football fans’ undivided attention—because America itself is dividing. World Wrestling Entertainment [WWE]’s Vince McMahon announced January 25 that he is bringing back the XFL, and Main Stream Media enforcers are furious. [‘Alt-Football?’ Left Furious At Return Of XFL, WND, January 26, 2018] But they shouldn’t be surprised: the return of the XFL is only natural at a time when the NFL is taking sides in the culture war against the Historic American Nation. And, just as Donald Trump rallied actual Americans to defy the MSM, McMahon could find a large constituency ready to defy our hostile elite. McMahon’s make sense considering his background. Though raised in North Carolina, he’s spent his adult life in Connecticut, where, after buying out his father’s stake in the WWF wrestling organization, he worked to consolidate wrestling territories across the country into the WWF (renamed WWE in 2002). The new wrestling franchise became a global phenomenon that created icons like Hulk Hogan, the Ultimate Warrior, Stone Cold Steve Austin and The Rock. From being a regional sideshow, McMahon turned the WWE into a powerful trendsetter in both sports and entertainment. The WWE has traditionally drawn on Politically Incorrect themes to create both heroes and villains. Older fans will remember Hulk Hogan desecrating the Soviet flag, as an American audience cheered wildly. But in more modern times, right-wing Americanism was treated with more complexity. I look around and I see a country I don’t even recognize. I see people with faces not like mine. I see people that I don’t even know what they’re saying. They can’t even talk to me. And I look around and I think, where did all these people come from? But most importantly I think, how do we get rid of ’em? We the people! Americans, real Americans, know the truth! Zeb Colter knows the truth! Jack Swagger knows the truth! Because this is the land of the free and the home of the brave, not the land of the free and whoever wants to cross our borders! … It’s our country and it’s our land, to protect and defend! In some ways, it presaged how Donald Trump himself went from reality show heel to hero in the eyes of so many Americans. 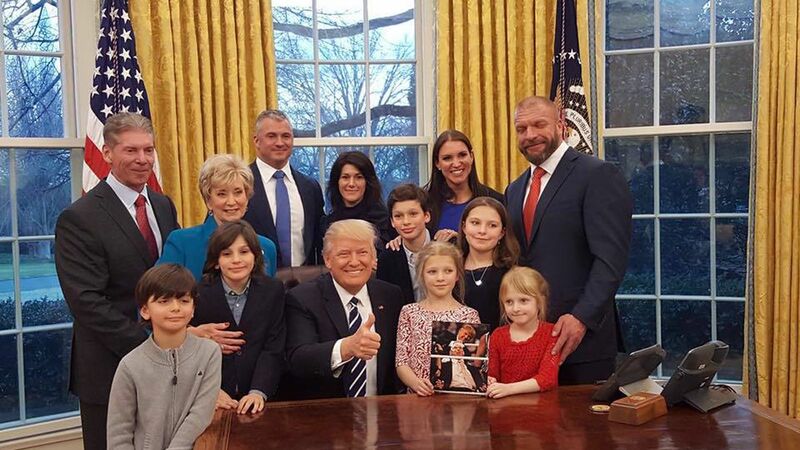 And while Vince’s wife, two-time CT GOP Senate nominee Linda McMahon, is hardly an immigration patriot, President Trump nonetheless chose her to be head of the Small Business Administration and hosted the McMahon family at the White House. These are arrogant reactions considering NFL ratings were down 10 percent in 2017 from the prior year, with white fans making up 85 percent of the lost viewership. [The NFL’s 2017 ratings slide was mainly fueled by white viewers and younger viewers, by Jason Clinkscales, AwfulAnnouncing.com, January 8, 2018]. The actions of black players may have been praised by Leftist sportswriters, but many fans saw them as divisive. In fact, there does seem to be a market for people who want to see a positive image of their country and who are disgusted with the NFL. [Veterans group not backing down from NFL over #PleaseStand ad rejected for Super Bowl program, by Peter Dawson, Star-Telegram, January 31, 2018] Like Trump, McMahon still believes the USA is like the nation of his youth, where hard work and love of country are the recipe for success in life. And he aims to serve that market. But McMahon may be underestimating what he’s facing. Colorblind patriotism is increasingly denounced as “white nationalism” today. And an increasing number of white people don’t just want an escape via politics-free entertainment—they really want their country back. As even professional sports begins to divide, every American is going to have to take a side on far more fundamental questions in the near future. The conflict is irrepressible.